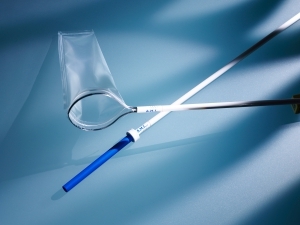 A.M.I.‘s extraction bags are fully-disposable instruments for removing specimen (e.g. appendix, gallbladders, ovaries etc.) during minimally-invasive surgical procedures. Special design features facilitate insertion into the abdominal cavity, as well as allowing easy, safe tissue retrieval. A particularly durable and easy-to-use extraction bag, which is removed from the abdominal cavity immediately after filling.